Hazel Marie Blaeuer, 96, of Breese, and formerly of Waverly, IL, died Thursday January 7, 2010 at Country Side Manor in Aviston. She was born June 4, 1913 in Franklin, IL to Edward and Nellie (Owens) Pence: they preceded her in death. She married Plenty C. “Cope” Blaeuer March 1, 1934 in Stonington, IL and he preceded her in death July 11, 1979. Also preceded in death by a son, David Allan Blaeuer EDD; a granddaughter, Saundra Fasig Van Veghal; brothers, Chester Pence, Ernest Ray Pence, Russell Pence; sisters, Eva Mae Pence Riffey, Grace Pence Henricks, Virgil Pence Corr. Surviving is a daughter, Linda (Lloyd) Frutiger of Breese, and a son, Mark Wayne (Sharon) Blaeuer of Pearcy Arkansas; a daughter-in-law, Carol Fasig, PhD of Bluffton SC; 7 Grandchildren Carma (Dr. Clinton M.) Smith of Breese, Craig Frutiger, Kurt Blaeuer, Lisa (Stephen)Truelove, Karl (Rose) Blaeuer, Greg (Jodi) Fasig, Steve (Amber) Fasig; 10 Great grandchildren, Elise, Evan and Lawson Smith, Michael Blaeuer, Lauren and Nick Westhora, Garrett and Rachel Fasig, Jamie and Aleksaundra Fasig. Hazel was a homemaker; she enjoyed her family, playing piano and organ at her church and crossword puzzles. Member of Waverly First United Methodist Church, Waverly, IL and Senior Citizens in Waverly, IL. Funeral service will be held on Saturday January 16 at 11:00 am at the Waverly First Methodist Church in Waverly with Rev. Robert Foulk officiating. Interment East Cemetery, Waverly. 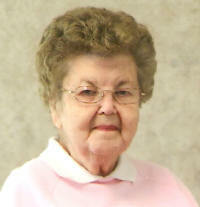 Visitation will be Friday, January 15, 2010 from 5 to 7 PM at the Moss Funeral Home in Breese and Saturday, January 16, 2010 from 10 am to time of service at the Waverly First United Methodist Church, Waverly, IL. Memorials can be made to Waverly First United Methodist Church and will be received at the funeral home or the Church.